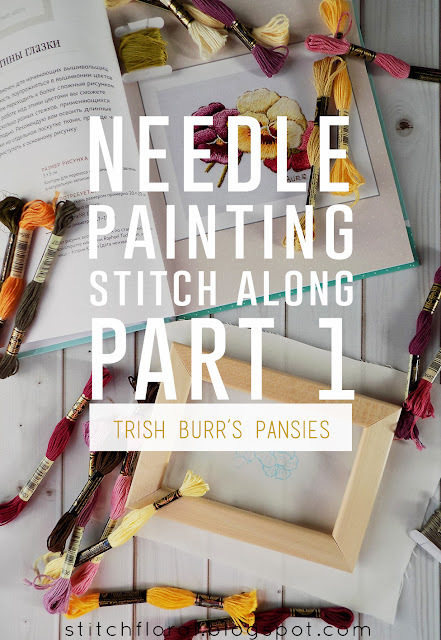 First things first, you can find the Pansies project in Trish Burr's “Miniature Needle Painting Embroidery” book which features lovely patterns made after vintage illustrations. 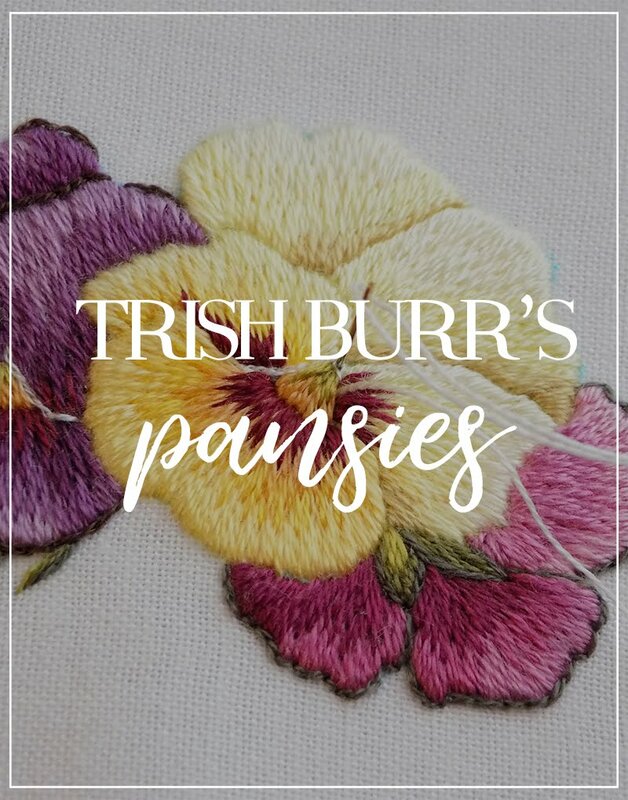 The talented embrioderess also holds an online store, but at the moment of writing this post the Pansies project couldn't be found there. 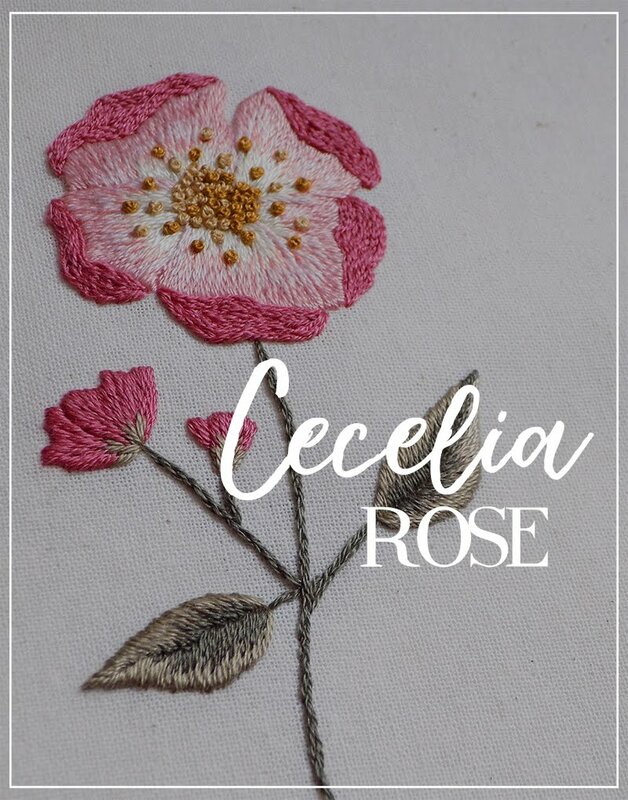 Anyway, I do recommend purchasing the book, because it contains LOADS of useful information and tips, not speaking about all the other lovely embroidery projects you can work. 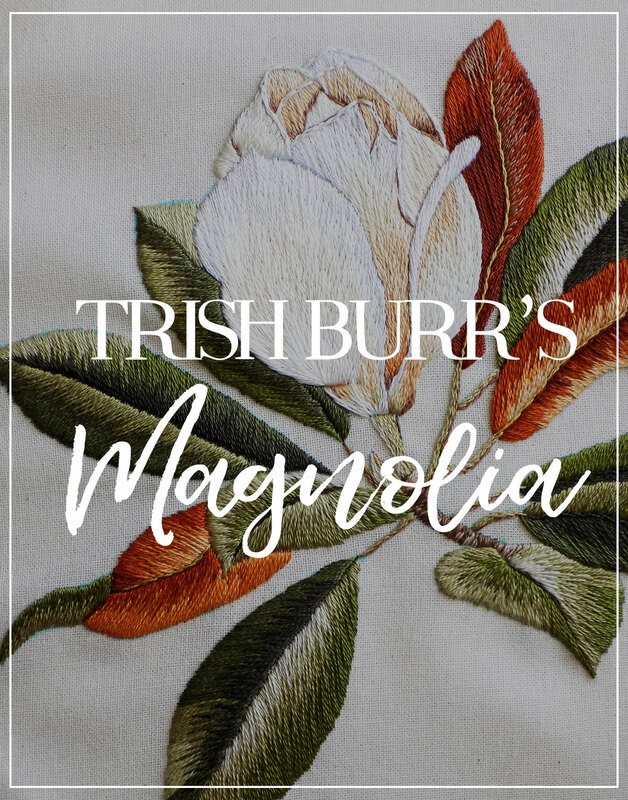 This book is definitely one of the must-haves in any embroidery library. Fabric. 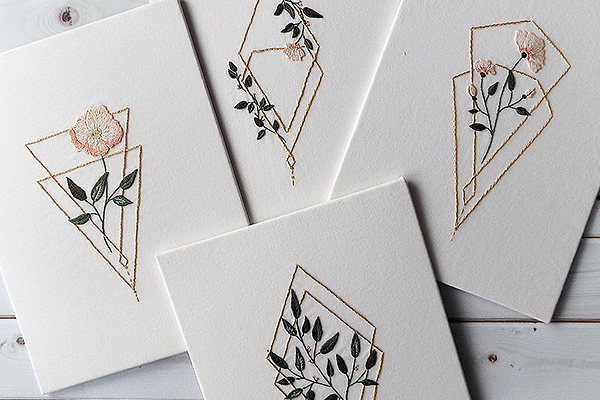 Needle painting implies making a LOT of stitches in a small space to fill it in. So, naturally, the fabric with a higher count should be used as a ground. Natural fibers like linen and cotton are the best options. Natural silk also fits this type of project. Aida is a no-no. I'm using a cotton muslin. Note that if the fabric is too light and transparent, you might want to back it up. The backing fabric should be preshrunk to avoid puckering. You might notice in the image above that my fabric is a bit transparent too, but this level is fine with me because the pattern is small and without any details outside the flower shapes,and we can skip worrying about random thread showing through. So I'm not using any backing fabric. Thread. This project uses 17 shades of DMC cotton embroidery floss and 3 shades of Gütermann sew-all polyester sewing thread. Since they don't import this thread here, I'm using equivalent DMC floss instead. You can find the PDF chart for matching Gütermann-DMC colors on Mary Corbet's Needle'n Thread. However if you have access to the Gütermann sewing thread, I recommend using it. 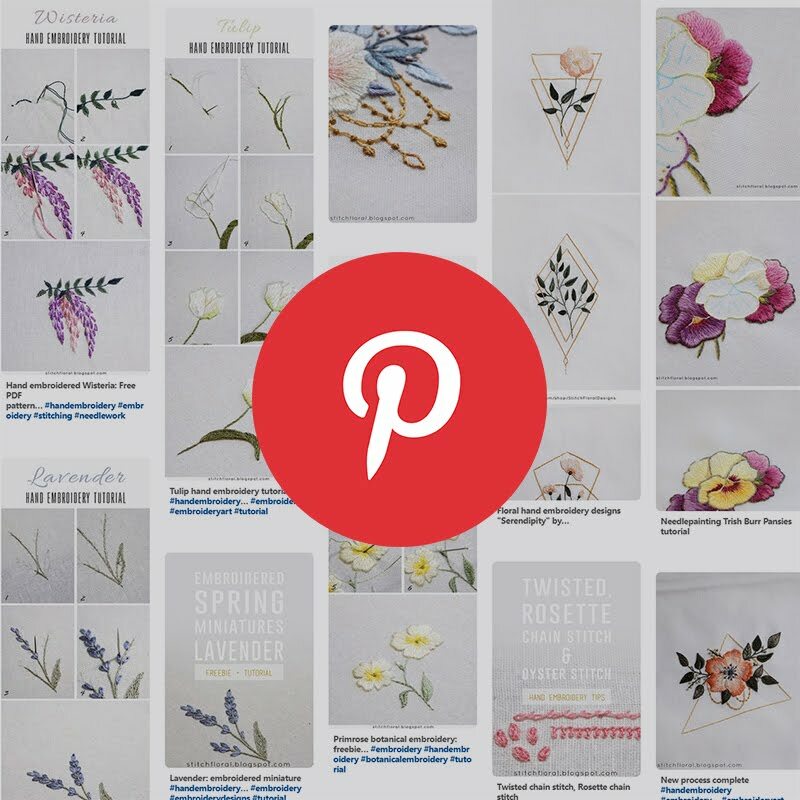 Trish Burr explains that this polyester thread is used mainly for thinner shading outline, because sometimes even one thread of DMC floss can be too thick. Seeing the scale of the project I understand what she means. Nevertheless, I have to go with the floss. We'll see how it works. 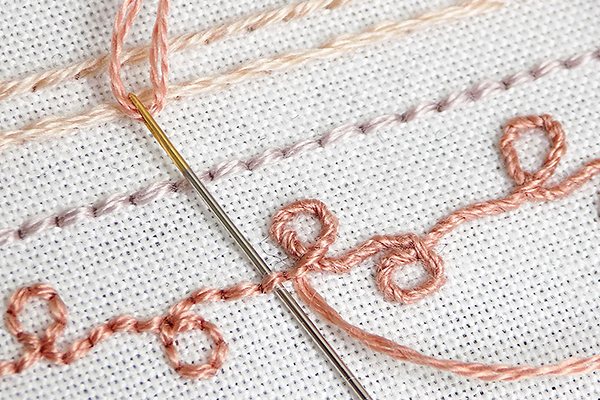 All the stitches in this project are worked having one thread of floss in the needle. Hoop. Use any good-quality hoop you have, making sure that the fabric is drum-tight as you are working. Trish Burr recommends Susan Bates Super Grip. The pansies project is worked using two types of stitches: long and short stitch and split back stitch. 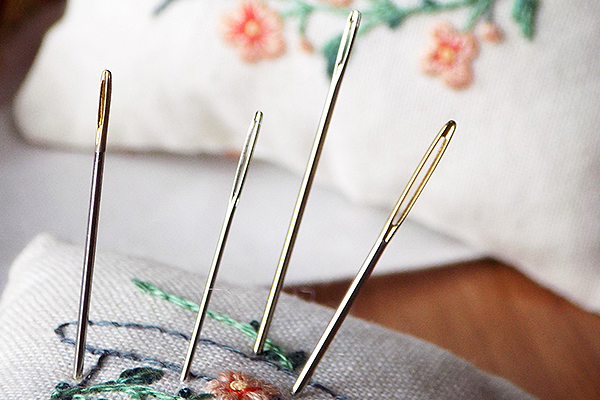 If you are not familiar with any of them, make some time to have them practiced on a piece of fabric. I already covered the long and short stitch with a complete step-by-step lesson and additional tips, so make sure you read it carefully and practice enough before starting with needle painting. Trish Burr also gives the non-obvious insightful tips in her book, but I won't delve into this in this particular post, because we are only going to make an outline at this stage. 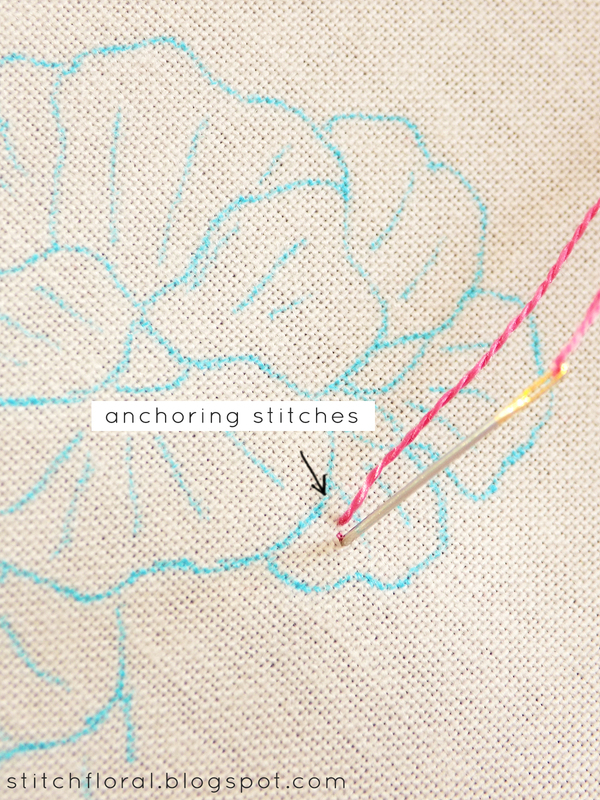 Let's save it for later, when we start with the long and short stitch. Now, I think we covered all the necessary information at this point? If you have any questions, leave them in the comments section below! We start needle painting by making an outline for the shapes we will fill in with long and short stitch. Outline is needed for raising the edges of petals a bit and giving them more volume. 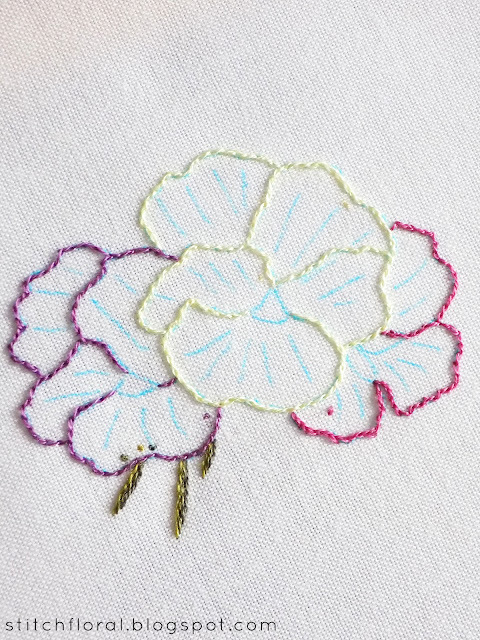 Since we are going to cover all the space inside the flower shapes, I start the thread by making tiny anchoring stitches inside the petals. I didn't redo the first petal, but the next one was worked already in the split back stitch. And I have to say that it felt much more convenient. The line got thinner and it followed the curves more eagerly. Lesson 1 – always check the diagrams twice, especially if you have a translated edition. A little tip that I think I didn't share before. 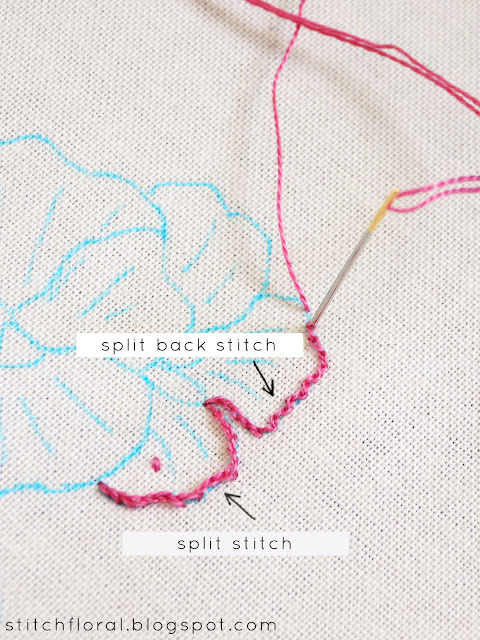 If you finished stitching the line and you need to start a new one in a distance, you can make tiny stitches along the next line to get to its point of beginning. Avoid making long thread transitions because it can cause puckering later. Finally, we work the stems using three shades of floss. The darkest one was supposed to be the sewing thread, but I decided to use DMC. Maybe that's why the stems actually look a bit thicker than in Trish Burr's embroidery? Well, let's wait for the final result. At this point, we're almost done with the split back stitch in this project. Actually, we're supposed to make an outline for the small leaves shapes in the right flower, but I decided to work it after filling the shapes in. I find it more convenient to stitch the “lower” shapes first and then cover with those that are placed “above”. Well, for now, everything is quite easy, huh? 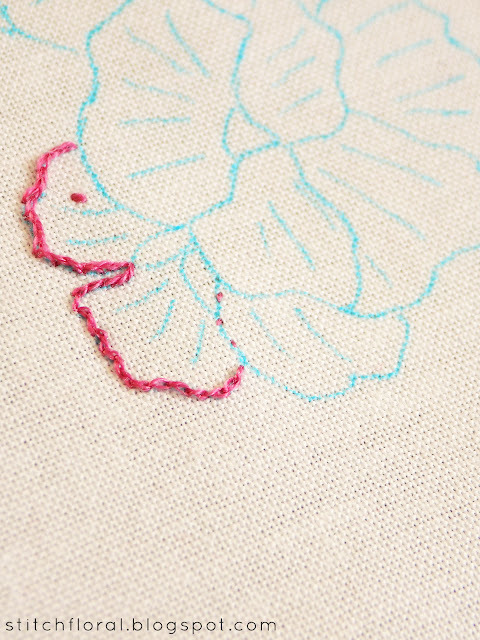 Next time we are going to fill in the right flower with long and short stitch. That's where the real fun will start! Look forward to the Part 2!